These top five amenities are attracting Millennials to properties and keeping them there. While location and price tend to be the driving decider for most, having the right mix of amenities can help edge the ever-evolving Millennial towards your property and increase retention rates. Millennials are a hard generation to nail down with their always changing interests and needs. While location and price tend to be the driving decider for most, having the right mix of amenities can help edge the ever-evolving Millennial towards your property and increase retention rates. These five amenities top the charts as Millennials’ must-haves. Smart storage. Millennials want large closets and extra storage for their trendy clothes and tech gadgets. 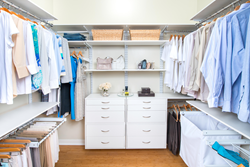 According to a recent Multifamily Executive survey, 49 percent of respondents would pay an additional $75 per month for a larger closet. While you could build that extra storage space, having a smartly designed closet organization system can negate the need to create larger closets saving you money. With Organized Living freedomRail adjustable closet system, you can maximize a standard size closet while still commanding a higher rent. Pet-friendly perks. Millennials love their pets and want the best for them. They will actively seek out apartments with lenient pet policies and exclusive perks. In fact, according to SunTrust Mortgage, 33 percent of Millennials chose a property based on their pet’s needs. Whether that’s a dog park, a pet washing station or on-site doggy day care, Millennials will not only pay more for these amenities but will stay longer to pamper their pooch. In-unit washer and dryer. Gone are the days of lugging laundry to the laundromat or to quarter-operated machines in the building. Millennials want the convenience of having an in-unit washer and dryer and are willing to pay more for this coveted feature. According to 2015 research from Trulia, residents would pay up to a 20 percent per month premium on rent for this in-unit luxury. Fitness center. Maintaining a healthy lifestyle and toned physical appearance is of utmost importance to Millennials everywhere. With the invention of Instagram, Snapchat and other social media platforms, image is more important than ever. On-site fitness centers are an easy way to command higher rent because of the convenience and availability. Millennials are opting to rent instead of purchasing homes. With the overbearing weight of student loans, an average of $37,172 per borrower according to Student Loan Hero, combined with the ease of renting, Millennials are in no rush to move to the ‘burbs. Whether you up your storage game or add other amenities to your properties, Organized Living is ready to help. With a complete breadth of products, comprehensive market research and an entire Multifamily division, we are dedicated to differentiating your property, increasing resident retention and commanding higher rents. For more information, check out OrganizedLiving.com/multifamily today.